In most of my posts on YouTube, I have mentioned that YouTube is a second largest search engine after Google. Over the years it has become a choice of the search engine as far as the videos are concerned & there is no doubt in that. The popularity is increasing day by day. The main reason behind this might be people's tendency to see videos rather than reading a text. Considering the popularity, everyone might think that, it should be earning so much money and the straight answer is, YES. YouTube does earn huge money out of its business revenue model. But you might think, how is that possible since it shows videos for free? Yes, that's possible. Let's have a look at YouTube's earning strategy. Many YouTubers as well as tech people looking for the questions; how does YouTube generate revenue? How do YouTubers get their money? How much money does a Youtube make a year? How does YouTube make a profit? Is Google making money from YouTube? 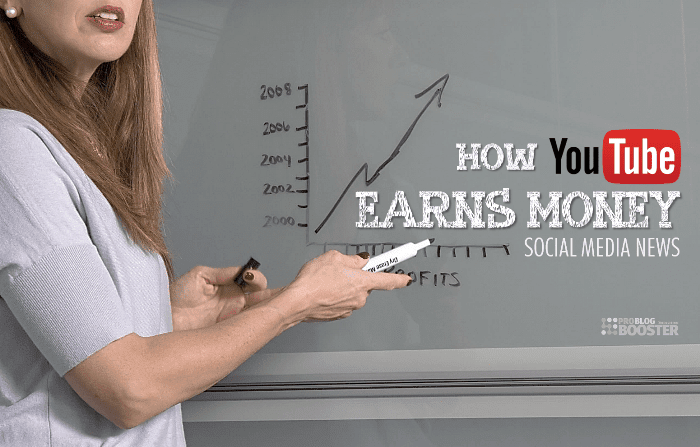 How YouTube earns money from videos? How does YouTube make money given that it is free to upload and view videos? How can YouTube increase its revenue per year with business models? Quick YouTube history - Before 23rd April 2005 people were only used to share the text through emails while photos, audio files & images were sent as email attachments. No one even could think of sharing videos on the internet as it was like only an imaginary thing. But this imaginary thing brought to the realization by three former PayPal employees Steve Chen, Chad Hurley & Jawed Karim and that was named YOUTUBE. They made video sharing very easy & funny. People only needed to search for their favorite video by visiting the site & enjoy playing video. Most importantly it was free. YouTube's traffic was on the flow but still, it was a long way from earning money. At the same time, the Google's own video services were struggling to stand in the market & its the reason bring the Google to bought the YouTube in November 2006 for $1.65 billion. Now the site acts as a subsidiary of the alphabet which lets users upload, view, share & comment on videos. Before we dive in to see how YouTube makes money it's important to see the charges that YouTube has. Hosting charge, uploading charges, distribution charges, transcoding charges etc. The approximate figure which YouTube pays for bandwidth is $30 million per month & that is really not a small amount. There are many sources from which YouTube able to make the profit and generate revenue through videos uploaded by the YouTubers. Including advertisements, YouTube makes money from paid content, sponsored videos, affiliate marketing, landing page advertisement, hosting YouTube shows (YouTube FanFest), Bidding targeted keywords, YouTube TV, and YouTube Red service too. In the previous post I was talking about; 6 Ways How Google Earns Money & Made Billions // Monetization, Revenues & Profits and in extension to that page, today we are going to check how YouTube work to generate revenue and how YouTubers are able to get money from uploading free videos on YouTube. Every advertiser has to pay for displaying their ad content on a website or anywhere else & this is where YouTube makes most of its money. The advertisers spend money on YouTube to display their advertisements on the videos uploaded by the users and then YouTube share this income with the creator of the videos. Usually, the creator/ YouTuber acts as an advertiser/publisher to publish the ads through their videos. YouTube also pays a part of that income (called as a commission) to that content owner on which the advertisement is displayed. Whenever you go through a content (text or video format) & land on the page, you will see the box written as 'Google ads'. This is nothing but space for ads. You will see some website's links there. This is Google AdSense advertisement & whenever anyone clicks on the link, YouTube is rewarded with the revenue. Whereas another category micro advertising is the Google ads displayed on the web page but not a part of the video. Also, sometimes you may have (may have because it is rare in the YouTube video) come across an advertisement immediately after clicking on a play button of a YouTube video or after the end of the video. This type of ads comes in the category of macro advertising. Amongst of millions of YouTube videos hardly 3-4 % of the videos have this kind of ads. Micro advertising is an advertising strategy in which marketing efforts are taken aimed to drive more views and so the ad views of targeted users. Micromarketing requires the advertisers to closely determine a customer's requirements according to the particular characteristic, like his location, favorite related videos for that particular marketing campaigns. These kinds of ads you can often see on YouTube. Whatever the type of ads the revenue is not gonna fall down. It rises according to the content related to the viewer which includes more targeted ads. Once the YouTube users approved and link the Google AdSense account to the YouTube channel, they can make money up to 68% of the ad revenue. YouTube doesn’t make money quickly but via commercials that are displayed in/within videos. Anyone who needs to promote their product or services need to spend money on YouTube via Google AdWords that is another source of YouTube’s revenue. Sponsors pay YouTube to display their advertisements on videos according to CPM activity (i.e. click-through, lead, sale). You may notice that the ads are not shown every time whenever you play the video, rather, only less than 45% the ads are getting displayed on the videos and the publisher earns money when viewer click on the ads. A landing page is the page of YouTube that shown first once the YouTube page is opened without logging in. Its nothing but the homepage on YouTube. According to a research, a video shown on the landing page can improve the conversions & user engagements by 82%. And exactly here the YouTube earns huge by selling those ad space to advertisers/ sponsors as landing page advertisement ad slots. The landing page ads on YouTube is just like banner form ads which can include both photos and videos and can be managed by promoters in various ways to promote the content. Now, the highest percentage of the income is generated from the YouTube users themselves who manage ads to monetize videos. YouTube users are allowed to show ads and make money from their videos only if its original unique and copyright protected. YouTube shares 55% of the income generated from advertisings to the video publishers (YouTubers) and holds the 45% share for itself. The next source of revenue for YouTube is sponsored partnerships. This started in the year 2008. Having sponsored partnerships with media firms like MGM, CBS, Viacom, Paramount allows these firms to post full film and episodes of TV serials on YouTube. In the year 2009 YouTube got tie-up with the media companies in the United Kingdom & launched this feature for users in the europian countries. For the first time in March 2010, the most popular format of cricket that is the Indian Premier League (IPL) cricket matches were shown live on YouTube all over the world. In many of my posts on YouTube, I have written about video SEO. If you know SEO you would also know what are keywords. Keywords are the basics to get the YouTube video in search results especially on YouTube engine. When you type something in YouTube's search box, you would see some suggestions. These are nothing but the keywords. Suppose if your video title is "How to lose weight in 10 days" then the keywords would be 'How to' 'lose weight', etc. So when someone types 'how to', 'lose weight' in YouTube search box then your title will come as a suggestion in the search result. This is where the keywords come in play. A keyword is the most important element for video SEO. So to get found your YouTube video in the search result, you have to bid for the keywords. More number of advertisers/sponsors bidding for keywords, YouTube will earn more revenue. Another advertisement revenue stream of YouTube is the embedded advertisement. This advertisement is played before the actual video begins. Also, short ads are placed in between videos, that also generate income. Google is trying to get people to watch videos directly on YouTube (so that they can use the real estate on the web to display more ads). As of now almost all viewers are directly watching embedded videos on other sites (which may or may not have google monetization) or just visiting in for the one odd video without clicking around and browsing further. To combat this – The YouTube business model is tweaked to give out higher incentives to content creators if the video is viewed on YouTube home rather than their own websites. Like Netflix’s marketing pattern, YouTube has also started its subscription-based freemium business model - YouTube Red, which delivers you an improved, uninterrupted user experience across YouTube including YouTube Music, & YouTube Gaming. This YouTube revenue model competition is a monthly subscription service based on the pay-per-month format for watching an ad-free version of YouTube with extra exclusive content that free users cannot access. Here, one requires spending some money to have a paid streaming subscription service entirely for YouTube in the US, Australia, Mexico, New Zealand, and South Korea, getting rid of watching advertisements as additional benefits in YouTube red. The subscription charge to register YouTube Red is $10 per month. The subscription fee essentially works as a replacement for watching ads. 1. Watch videos without advertisements. 2. Exclusive YouTube Red content. 3. Free "Google Play Music" subscription. The exclusive live TV streaming service is available for the US by YouTube TV that allows the subscribers to see cable channels like FOX, ABC, NBC, ESPN, Disney, and other added channels on YouTube. With more than billion users, this YouTube business model is growing and getting popular at a faster speed. The subscription charge to register YouTube Red is $35 per month for more than 45 channels. You must have noticed related products under some videos on YouTube. These products link to the affiliate partners which pays commission to YouTube if you buy their products. Can you earn money with YouTube Live videos? The answer is YES. The viewer and subscribers can donate money through chat, you can also show the ads on a YouTube Live broadcast to make ad income, and moreover, that particular video will always be there your YouTube channel for new visitors and followers to watch it later or anytime, which could be monetized like all your other videos.